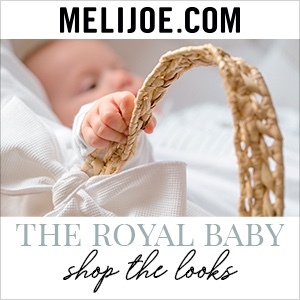 We are back with some quick updates and then a look at clothing items worn by Princess Charlotte and Prince George that have been identified. 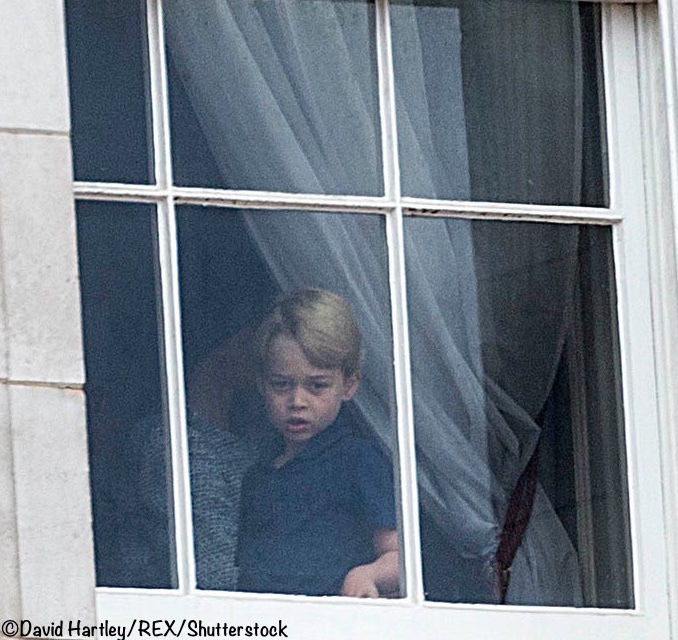 Update #1 involves Prince George’s fifth birthday on Sunday. I’ve been getting some questions about the likelihood of a new photo being released to mark the occasion. I would say chances are 50-50. It’s possible the position will be that the christening pictures were just released and we have also seen plenty of the children recently. The other side of the coin is that Matt Porteous, who took George’s third birthday photos, was at the christening and may have done a new photo. We’ll have to wait and see. Update #2 is simply that it looks like the Cambridges are taking their first vacation as a family of five. If rumors are true (and there is no confirmation from Kensington Palace, they do not confirm or deny questions about private occasions and events like vacations), the family is on Mustique. This is where the Middletons and the Cambridges generally go in January; this year they did not get away. Update #3 offers a look at a previously unseen photo of Prince Charles, Prince William, and Prince George. 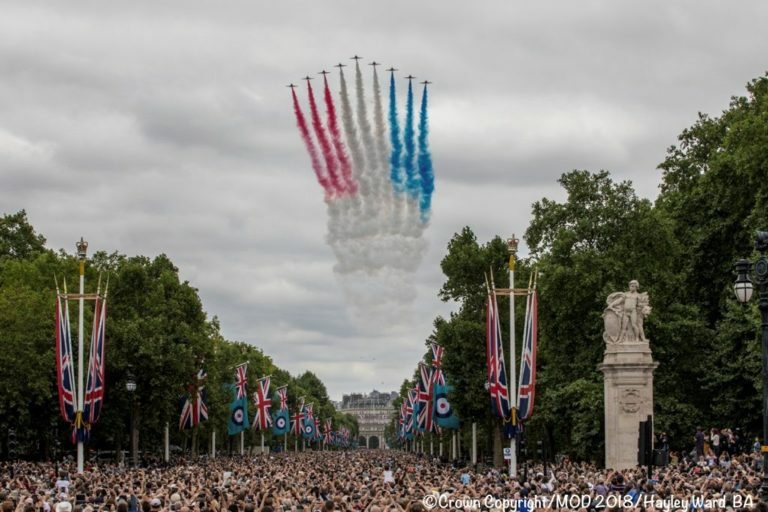 Royal family members watched the incredible RAF display from the iconic balcony at Buckingham Palace. 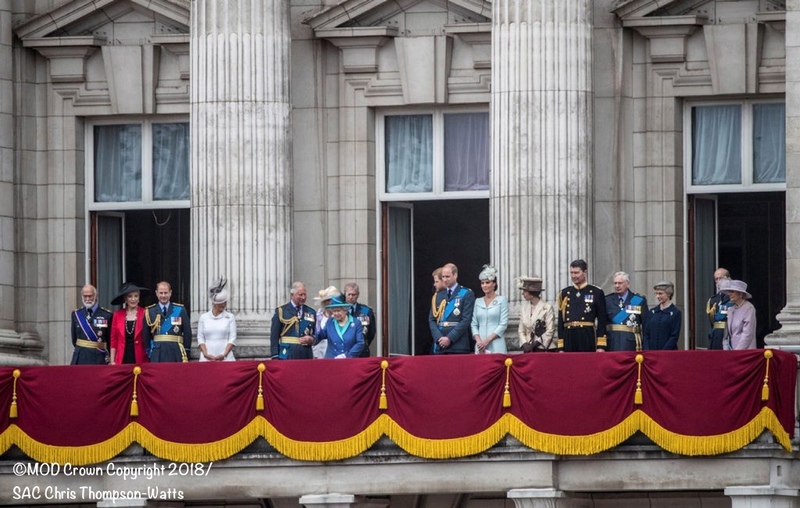 As it turned out, not all of the Royals watched from the balcony. 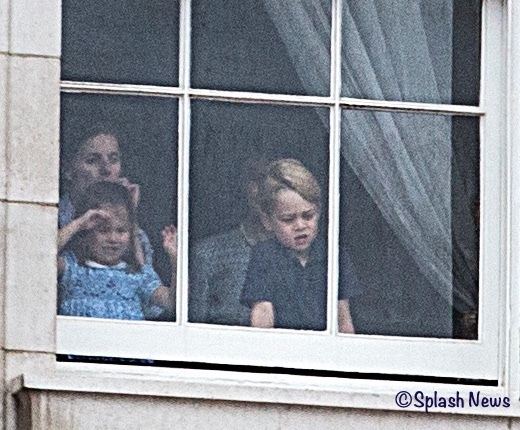 Many of you may have probably seen the photos with Charlotte and George watching the flyby with nanny Maria Borrallo (here are far better pictures on other sites than what I have been able to license). After the pictures came out, George on the FB page got in touch to say he thinks Charlotte was wearing the same dress she wore to the Lindo Wing when Louis was born. 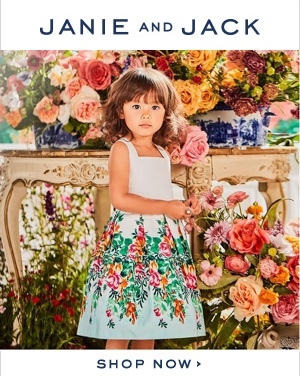 That is the Little Alice London Bluebell Peter Pan dress, shown in a different fabric than what was used for Charlotte’s dress. 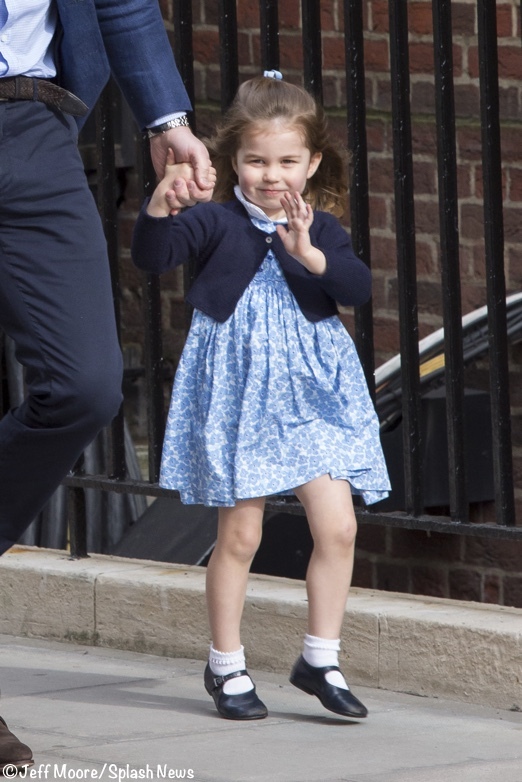 I think George is correct; Charlotte was in the Bluebell dress seen in April. One aside about Little Alice London: much of their stock was depleted when Charlotte’s dress was first identified. 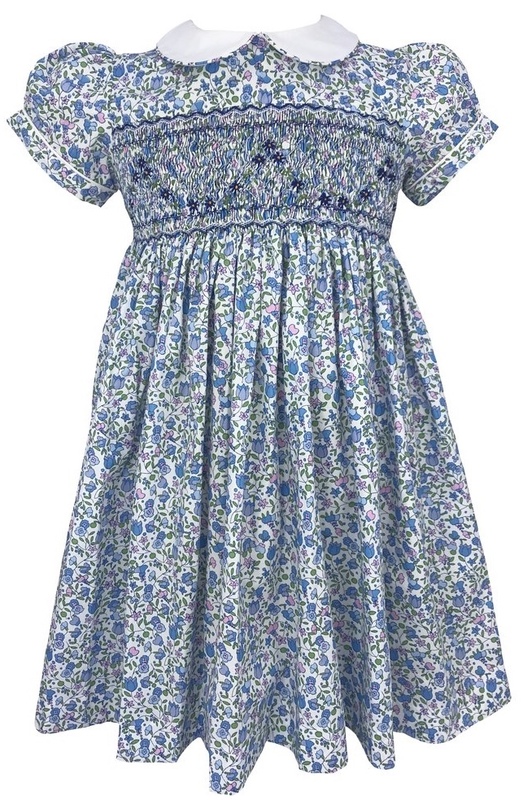 While her style is not yet available, a number of other smocked dresses are, although sizing is very limited, and generally restricted to 3M and 6M. Among the pieces now available: the Davina in blue floral, the Allegra, and the Ophelia. It’s impossible to guess what George is wearing in the photo, other than what looks like a navy polo shirt. The next item on the list, the polo shirt worn by Prince George to the Houghton Horse Trials. Last Saturday, Pauline tweeted that George’s shirt looked like an H&M style; she found the style on the H&M France site. I think Pauline is spot-on, it very much looks like the shirt Prince George wore. 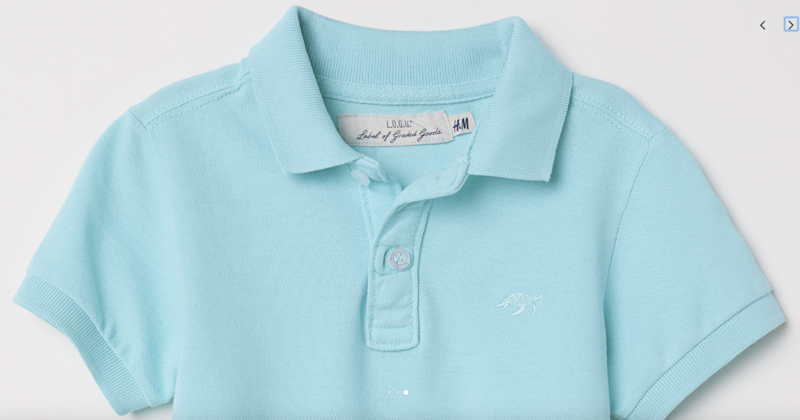 The polo is from H&M’s LOGG line, Label of Graded Goods. It is a little unusual in that the embroidery on the chest depicts a turtle, as opposed to the horse often seen on H&M polos. I wasn’t able to find George’s exact shirt online; I believe the style is sold out. 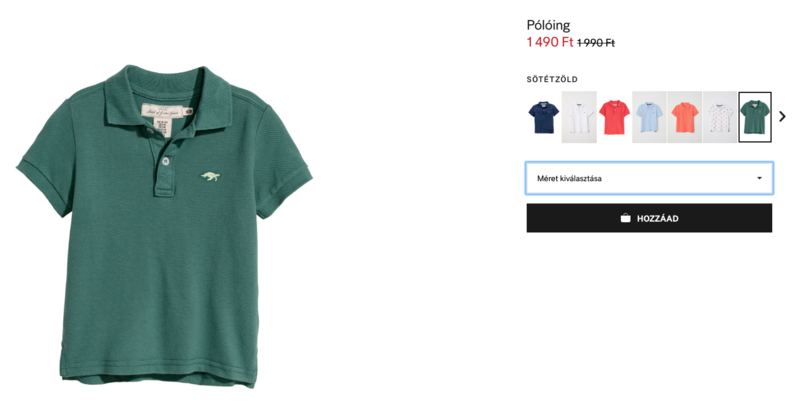 UPDATE: With thanks to Dóra on the WKKW Facebook page, the shirt is still available at H&M Hungary in larger sizes. It is 1490 Ft (Forint), that’s roughly $5.35/£4 at today’s exchange rates. 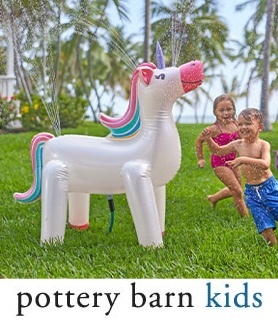 Thank you to Dóra on the Kids FB page for the tip! I did find one other style with the turtle embroidery ($7.99). It makes perfect sense that Kate would have George in a LOGG piece. The shirts are 100% cotton, with details like taped seams and tennis tails (originally created so shirts wouldn’t come untucked when playing tennis) and they look fairly durable. The shirts are also offered in 2-packs ($9.99). 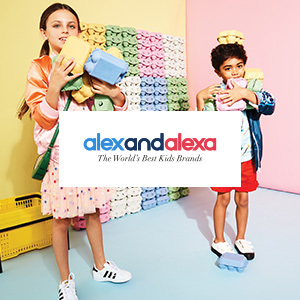 It wouldn’t be surprising to see Prince George in other H&M items, especially those from the LOGG collection, or the retailer’s ‘Conscious’ line, made with organic fibers. Thank you to everyone for being so generous in sharing your information and your photos! 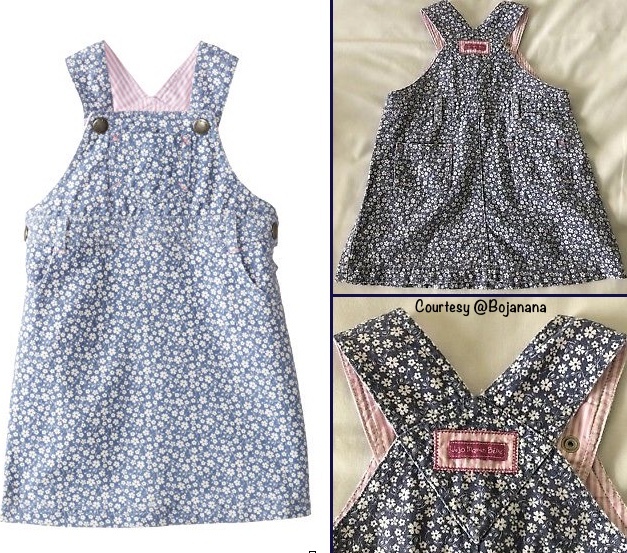 The final item is Charlotte’s dungaree dress by JoJo Maman Bébé. 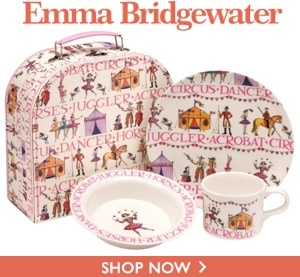 She was wearing it in a photo taken when Charlotte and Prince Louis were out for a stroll with Kate and nanny Maria Borrallo. We shared photos of a similar style in this post. It turns out that Bojanana, who has been so helpful with IDs over the years, sent me a photo back in May of the exact piece Charlotte wore. Unfortunately, yours truly had wedding brain at the time and completely forgot about the information. Thankfully, Bojanana touched base this week, and I can add her information and photo. 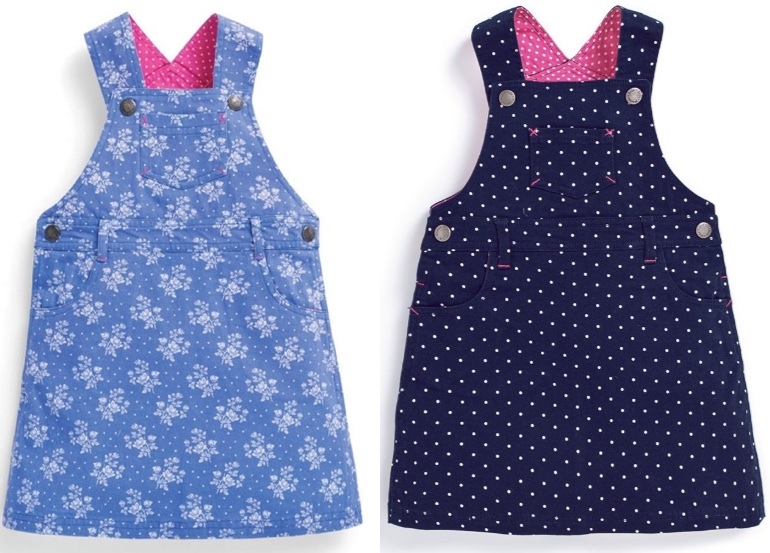 The name for the piece was the “Ditsy Twill Dungaree Dress” as shown on this website. 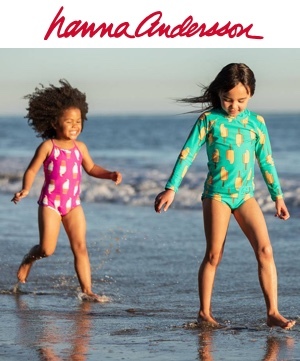 This is a basic piece made every year by the retailer. It remains available in other patterns, including the Cornflower Blue Floral design (on sale for $15) and a Dotty Navy Twill ($21). Thank you to everyone for all of your help on IDs! 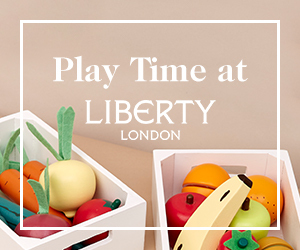 We do have a quick product restocking note. 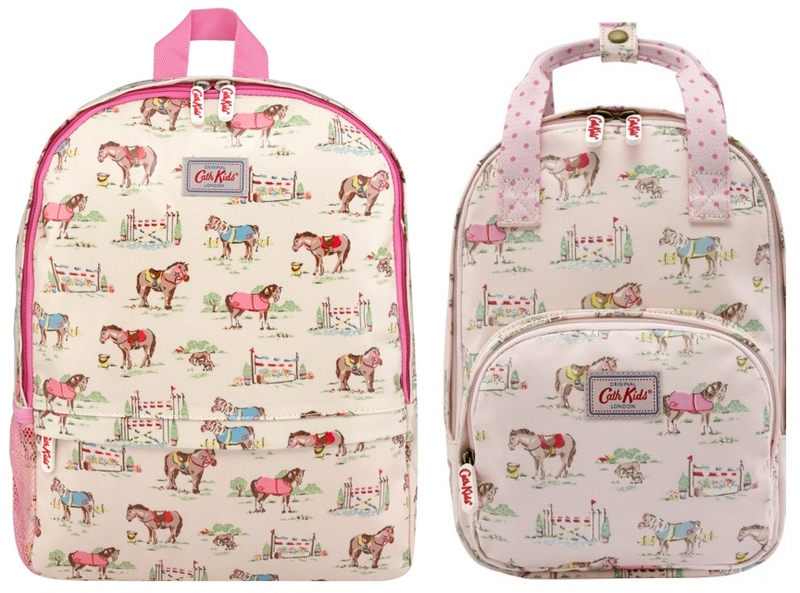 Carly got in touch on Facebook to let us know that Cath Kidston has new items in a print called “pony kids” that is almost identical to the pink pony design on Charlotte’s backpack last year. You can see the difference in the pattern below: the background color for the new design is an ivory shade (below left), while last year’s background color was pink (below right). There is a backpack in the new pattern ($48), but it isn’t identical in size and design elements. 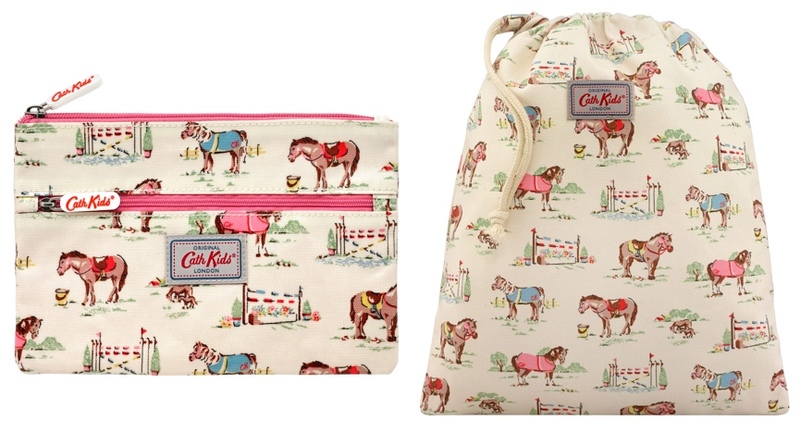 Other pieces in the new print: a Double Zip Pencil Case ($15) and a Drawstring Wash Bag ($15). Thank you, Carly, for letting us know about the new items! Hopefully, we’ll be back this weekend with a post showing a new picture of George. Oh my goodness, what a wonderful post!! 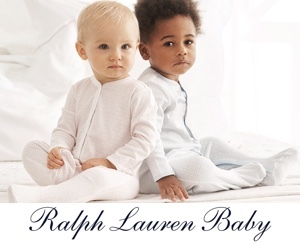 All these great ID’s really help me firm up on what Kate’s offspring are wearing. The Bluebell Peter Pan dress is stunning, it looks so beautifully made, I’m glad Charlotte managed to get a second outing from it given she seems to be getting taller on every outing. The smocking work is superb and the lovely soft cotton gathers so well. 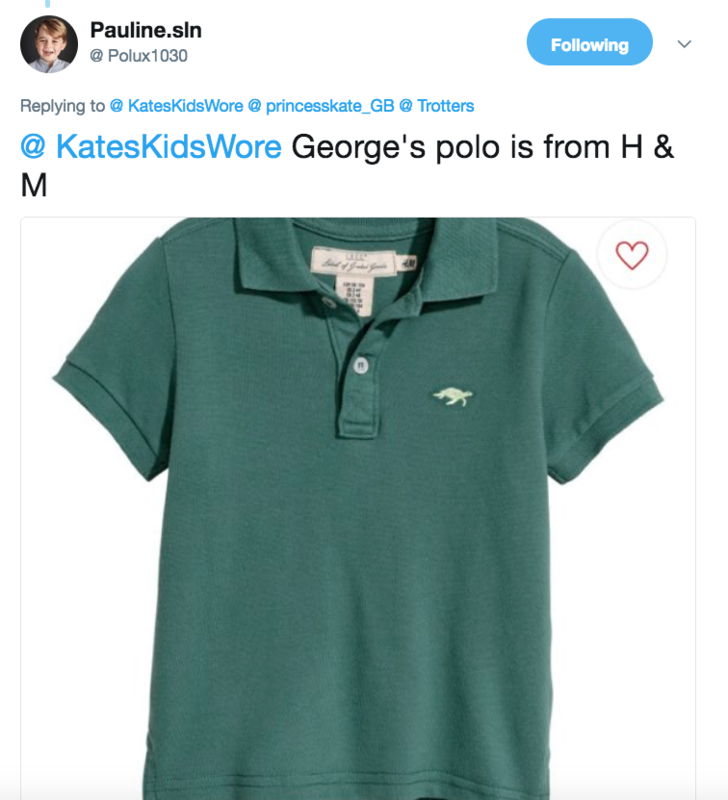 And hooray for two class IDs from the polo outing, I think that’s two fashion ‘break-out’ moments there, a fresh colour for George’s polo shirt and Charlotte going sleeveless.George’s faded green top is a fun off-beat colour and some relief from his regular navy uniform. I’m interested to learn of the H&M LOGG line, looks a good one, well-made and able to survive tough usage. Charlotte’s dungaree dress is just cute, well done JoJo Maman Bebe, it looks tough, comfortable and yet indisputably feminine. Just the ticket.